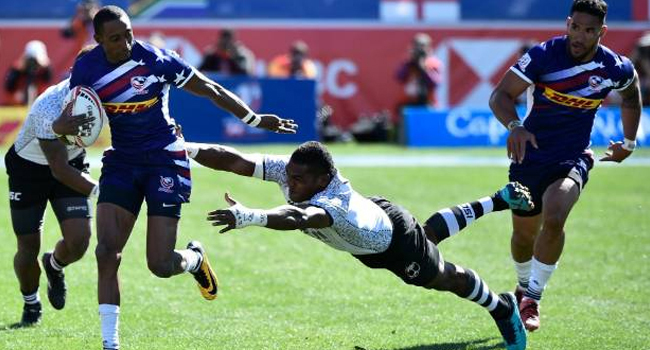 The Fiji Airways mens 7s side has been bundled out of the Cup quarterfinal after going down 24-14 to USA in Dubai. The Gareth-Baber-coached side was outclassed by the USA in all aspects of the game. USA led 12-7 at half time. In the quarterfinals, England defeated South Africa 22-5, New Zealand beat Scotland 21-7 and Australia thumped Argentina 38-nil. Fiji will face Argentina in the 5th place semifinal at 12.55am while South Africa meets Scotland in the semifinal earlier at 12.33am. In the Cup semifinal New Zealand plays England at 1.17am while Australia meets USA at 1.39am. The final is scheduled for 4.29am tomorrow and you can watch the entire tournament live on FBC TV.